The fifth in our popular electric and diesel miscellany series covering classic ‘modern’ traction from the 1960s through to the 1980s. Much of this footage is over 50 years old and once again we travel far and wide with a multitude of locomotive types in a huge variety of very different locations. We start with diesel hydraulic activities, including “Warships”, at Bristol, Plymouth and around Swansea. Then on to the Pembroke Dock branch for DMUs and Hymeks. Travelling north we witness scenes at Scarborough (including a Royal Train working), York (for Deltics in action) and Class 56s near Selby. Back south again and to the Weymouth line for Class 33s on push-pull operations through the Bincombe tunnels. Returning north once more, we visit Crewe during the modernisation in 1985 and the Woodhead Route for Class 76s on freight and passenger workings. Down in London, at Paddington station, we see even more hydraulics plus a variety of English Electric traction before visiting King’s Cross. Other locations seen briefly include the Settle & Carlisle line, the Shrewsbury area, Hanwell, Weston Rhyn and Loggerheads. We also feature some unusual footage of an excursion with a Southern 2-BIL electric multiple unit at the very end of their working lives. A brief look at the “Class 44 Farewell” tour is followed by a section devoted to the Metropolitan electric locomotive tour of 1972 starring the two now preserved examples Nos. 5 & 12 hauling a rake of Guards Vans. We return to Crewe to see a “Royal Scot” tour departing with a Class 40. The Brymbo branch and Bersham colliery are well covered with Peaks and Class 47s on coal trains. Plus we include a glimpse of a couple of industrial steam engines! Returning north once again, vintage electric multiple units are seen on the Morecambe branch of the unique experimental line from Lancaster Green Ayre. Finally, to bring back memories for some, we conclude with some footage of DMUs on now long lost and closed lines. Many of the locomotive classes that existed during this period are seen: 03, 08, 20, 24, 25, 31, 33, 35, 37, 40, 44, 45, 47, 50, 52, 55, 76, 81 – 86, 87…in fact there very few are left out! 86258 “Talyllyn—The First Preserved Railway” passes Stafford, 19/5/1984. The sixth volume in our popular “Miscellany” series to cover London Midland steam compiled from mostly unseen footage and in the order the film runs off the original cine reels. Not only do we cover London Midland engines operating in their home region but also elsewhere. In fact, we start with a few shots of them working on the Southern Region in 1965, before visiting the Gloucester and Bristol areas for a variety of steam action, including some rare footage of ex-MR dock tank No.41537 going about it’s business, and then on to North Wales for scenes at Bangor, Menai Bridge and Bodfari. Next we visit Rugby in January 1962 and amongst all the action, the unique Class 8 Pacific No.71000 “Duke of Gloucester” passes by. Two visits are then made to Staveley Ironworks to see the Victorian ex-MR 1F “half-cabs” at work followed by visits to Boroughbridge, Shap, Carlisle (including Canal Shed), Oxford, Hereford and Bletchley. The “East Devon” rail tour is seen in 1965 on the Lyme Regis branch and near Exmouth, followed by the “Farewell to the Stratford-on-Avon and Midland Junction Railway” tour of April 1965, and a few months later by the “Northamptonshire Branches” brake van tour with 2-6-0 No.78028. Other tours covered in 1965 are the Warwickshire Railway Society’s “Midlander” plus the SLS’s “Midland Locomotive Requiem”. Travelling south once again, we visit the S&DJR at Shepton Mallet, Evercreech Junction and Templecombe. Then to Stonehouse (Bristol Road), the Nailsworth branch and Coaley Junction plus the west bank of the Severn Estuary including Aylburton, Bullo Pill, Lydney and Undy. There is extensive coverage at Banbury with steam on passenger and freight workings including the short time when Britannias were allocated there. Super “D”s are seen in the West Midlands and other places such as Crewe, Wakefield, Wrexham, Chester and Birkenhead Woodside. Finally we visit the North-West for steam action at locations such as Farrington Junction, Preston, Carnforth, Rose Grove, Bolton and Manchester. 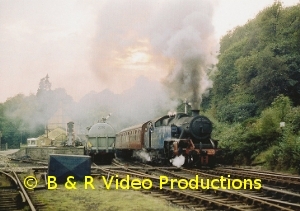 The archive film is almost entirely in colour and was taken in the six years leading up the end of steam in 1968. Motive power includes ex-LMS Black 5s, 8Fs, 4Fs, 2-6-4Ts, ex-MR dock tanks, Jinties, Class 2 & 4 Ivatts, Duchesses, Jubilees, Royal Scots, Patriots, Super “D”s and BR standard Britannias, 72xxx, 73xxx, 75xxx, 84xxx and 9F 2-10-0s. An authentic sound track has been added along with an informative commentary to complement this nostalgic look at the last years of London Midland steam. Cover photo:- Keith Pirt/Courtesy Book Law Publications:- Britannia 70014 “Iron Duke” at Carlisle Upperby, July 1967. The fifth in our miscellany series covering London Midland steam is compiled from reviously unseen high standard footage taken by the late Harry Ashby. A bit different to the norm, it features a high proportion of freight trains. We begin on the line from Shrewsbury to Wolverhampton with coverage at Hollinswood Junction, Madeley Junction, Shifnal and in particular at Cosford. The latter was favourite haunt of Harry Ashby and much time is spent here watching the all-steam activity. It even includes footage of two passing V-bombers! Next there are scenes along the old North Staffordshire line from Burton-on-Trent to Uttoxeter at Scropton and Tutbury while Aldridge is seen under a blanket of snow in February 1966. Another well covered location is Elford Loop on the Midland route from Derby to Birmingham plus film taken near to Haselour water troughs. We watch a seemingly never ending stream of freight trains passing by at Wichnor Sidings and Wichnor Junction to the south of Burton-on-Trent. Other locations visited include Lichfield Trent Valley, Lichfield City, Colwich and Winwick Junction to the north of Warrington on the WCML. There is excellent quality film of the Peak District including Buxton shed and yards, Great Rocks Junction and Peak Forest. In 1967, Harry travelled on an SLS tour from Stockport over the Pennines and through Leeds to York behind Britannia No.70038 “Robin Hood” and also in 1965 on the WRS “Pennine” tour with plenty of coverage at Leeds and at Carlisle Kingmoor shed. The time period for the majority of the film is the five or so years prior to the end of steam in 1968. Motive power includes BR Standard Britannia and Clan pacifics, Class 5s, Class 4 4-6-0s and 2-6-0s and 9F 2-10-0s as well as ex-LMS Black 5s, 8Fs, Jubilees, Ivatt Class 2 and 4 2-6-0s plus WD 2-8-0s and an ex-LNER B1 and K1! 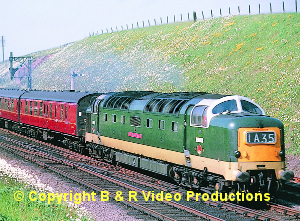 The archive film is entirely in colour An authentic sound track has been added along with a commentary to complement this further nostalgic look at the last years of London Midland steam. Cover photo:- Keith Pirt/Courtesy Book Law Publications:- Black 5 No.44810 passes Rowington Water Troughs, June 1962. In this volume we continue our “Classic Traction” theme covering many of the different classes of locomotives that were in operation across all regions of the network during the 1970s and 1980s. Most of the clips selected have not been previously seen. As before with we have simply compiled the film clips in no particular order and thus a few surprises will be in store as you enjoy the video. Starting with the Southern, we see Class 33s in action and then over on the Western we see Class 52s and Class 50s in and around the Paddington area. At Old Oak Common Depot a number of Hymeks and other types are stabled around the last of the four round-house turntables. Class 47s are seen all over the network hauling all manner of trains. Several Hymeks are seen working, including D7017 emblazoned with the D & EG signs after purchase by the Group. On the East Coast Main Line, the famous Deltics are in action (including a glimpse of the first ever Deltic visit to Inverness) and we visit King’s Cross, Brookmans Park, Welwyn Viaduct, Hitchin, Cadwell, York plus several other locations. In Scotland we see class 26s on the Kyle line. Class 20s were well known for working pairs and we see these on MGR coal trains at locations such as Warrington for the Fiddlers Ferry Power Station. At Tinsley Yard we see one of three class 13s stabled. These were a development from the class 08 and especially built for the yard. Most unusual are the scenes from the old Burry Port and Gwendraeth Railway with triple-headed 03s, working on the restricted height line, which in its early days was actually a canal! More freight action includes parcels traffic, steel coil, fuel & chemical tank trains and Presflow wagon workings. A few scenes of London Underground units are followed by BR DMUs and EMUs on the Southern, Watford and Southport lines. A rarely seen Motor Parcels van is captured hauling two baggage vans out of Paddington. A German built railbus is also spotted meandering around Kemble. Plus a few shots taken around the South Wales Collieries. On the West Coast Main Line we see class 85 & 86 electrics followed by a pair of EM1 Bo-Bos on the Woodhead route. Other locations include Churchdown, Banbury, Didcot, Bishops Stortford, (where we see a special guards-van railtour) as well as Barnetby and Chester. Harlow Mill features several stone trains arriving and departing with a variety of 37s, 47s, 56s, 58s, a 59 and 60s providing the power. We also visit High Wycombe, Bletchley, Cheltenham and Shrewsbury areas. Plus a couple of scenes from Wennington and the Settle & Carlisle. With such a diverse range of locomotives there is an equally diverse range of liveries, from original green two-tone, BR Corporate Blue, Large-Logo, Railfreight sector variants, Inter-City and more including special ‘one-offs’ such as the ‘Yellow Peril’ No.47803. We also see the Crewe Test Train in action plus a couple of passing Motorail services. Cover photo:- Keith Pirt/Courtesy Book Law Publications, Type 4 D1576 in the New Forest with the up “Bournemouth Belle”, July 1967. THE JIM CLEMENS COLLECTION No.32. The third in our miscellany series covering London Midland steam. Using mostly unseen film taken from the Jim Clemens collection it is largely assembled in the order the film runs off the original cine reels and has coverage across much of the Region. We visit Bescot in December 1964 to witness the end of the LNWR ‘Super Ds’, Carlisle Kingmoor shed in both 1964 and 1967, the Crewe to Carlisle line behind ‘Coronations’ and ‘Britannias’, the last day of the Stanbridgeford to Leighton Buzzard line in June 1962, the Wolverton to Newport Pagnell branch in August 1964 and group action at Lichfield Trent Valley in 1963. Next we travel to Bromsgrove for scenes on the Lickey Incline between 1961 and 1964, including the now-preserved Jubilee “Kolhapur” making an unaided ascent on a freight train. We continue along the ‘loop line’ from Barnt Green, through Redditch, Alcester, and Evesham to Ashchurch just before its closure as a through route in 1962. Onwards to the Worcester area and then along the branch from Ashchurch to Tewkesbury, Ripple, and Upton-on-Severn in 1959 and 1960 with 4Fs and 3Fs. This is followed by scenes at Halesowen, Dowery Dell Viaduct, Saltley shed in November 1961, the Gloucester area and Bristol Temple Meads between 1960 and 1965. A visit to Birkenhead shed in February 1967 sees a profusion of 9Fs plus the end of the ‘Crabs’. There is footage of Shrewsbury to Ruabon line, Wrexham, Chester in the mid-1960s and Northwich, Patricroft and Lostock Hall sheds at the beginning of 1968. The last train is seen over the SMJR from Stratford to Woodford Halse in April 1965 with a 4F and we visit Banbury in the summer of 1966 with Black 5s. Finally there are visits to the branches from Bedford to both Northampton and Hitchin in 1959 hauled by Ivatt 2-6-2Ts. There is something for all LM enthusiasts with a variety of classes ranging from ‘Coronations’, ‘Royal Scots’, ‘Jubilees’, and Black 5s, all the way down to even 2Fs – a London Midland delight!! The archive film is mostly in colour and filmed in the late 1950s and the 1960s. An authentic sound track has been added along with commentary to complement this further nostalgic look at the last years of London Midland steam. Cover photo:- Jim Clemens, 3F 0-6-0T No.43645 at Ashchurch in 1961. This is the second volume in a series featuring diesel-electric locomotives of British Rail. Here we feature the higher end of the power range dealing with Types 3, 4 and 5 as well as HSTs. Many locations are visited, from the West Country to both East and West Coast Main Lines. Scenes also cover the Lickey Incline, Shropshire, Settle & Carlisle, Taplow, Manchester Victoria, Chester, King’s Cross and Hitchin to name a few. We also include some extremely rare footage of the Hawker-Siddeley “Kestrel” in action at the Brush Works in Loughborough. Other classes include 33, 37, 40, 45, 46, 47, 50, 55 and 56, plus some odd glimpses of Metro Vick Co-Bos, Baby Deltics and a Class 13 at Tinsley with 40 001 running around. Spread over a number of years we see many types in their original green liveries as well as their later Corporate Blue. Other features include a Class 45 working with a brake tender, a couple of shots of the ill-fated DP2 plus an extraordinary scene on Shap where following a EE Type 4 failure a steam banker is used behind which is another EE Type 4 complete with its own train! A number of special workings also feature such as the “Deltic Fenman” and the “Deltic Devonian”. We also see the 1977 introduced “Jubilee” at Chelmsford with a pristine 47 164 complete with a Union Jack emblazoned on its sides. Several Pullman trains are seen including the “Tyne-Tees Pullman”, “Yorkshire Pullman” and “Queen of Scots”. We enjoy scenes of 47s, 50s and HST along the sea wall at Dawlish as well as the comings and goings at York with numerous Deltics in action. There are some brief shots of the HST prototype at Shildon; now the subject of “Project Miller”. We do not ignore freight and many different types of goods traffic are seen from early mixed consists, Speedlink, tanks, stone and Merry-go-Round trains, the latter in the hands of both Class 47s and 56s. All in colour throughout except for the Kestrel film. An authentic soundtrack has been added along with an extensively researched commentary. Cover photo:- Cover photo:- Keith Pirt/Courtesy Book Law Publications, D9013 “The Black Watch” near Gamston Signal Box, June 1963. In this sixth part of our series, we cover the lines around the Scottish Lowlands, the Borders area and the South West. We begin with steam and diesel activity at Edinburgh Waverley including a visit to St.Margaret’s Shed. North of the Border, regular Easter features were the “Scottish Rambler” rail tours. In 1963 these were jointly organised by the Stephenson Locomotive Society and Branch Line Society. It gave an opportunity to travel over branch lines that had lost their passenger service years earlier. On Easter Sunday, 14th.April 1963, we visit Reston to Duns, Tweedmouth to Wooler and the Coldstream, Roxburgh, Jedburgh and Greenlaw lines. Two strategic routes that are sadly no longer with us were the Waverley Route from Edinburgh to Carlisle and the Port Road from Dumfries to Stranraer. We feature footage along both lines. Also included are the branches to Lockerbie, Kirkcudbright, Whithorn and Garlieston. In the middle of the Galloway Moors we visit the lonely passing place of Loch Skerrow with no road access and the impressive “Big Water of Fleet” viaduct. Coal traffic was thriving around Newton-on-Ayre and we also visit the NCB steam operated system at Waterside. All the archive film used is mainly in colour and was filmed between 1963 and 1966. Motive power seen varies from ex-Caledonian and ex-North British types through to BR Standards. We even include the last ever passenger working with a Caley “Jumbo” 0-6-0! A detailed commentary and authentic sound track completes a nostalgic look at the railways of Southern Scotland. This volume features steam traction in the Somerset and Dorset areas of the West Country and in particular the famous Somerset & Dorset Joint Railway from Bath to Bournemouth with both normal service and special trains. We start with a glimpse of the ex-SR West of England main line before witnessing Bulleid Pacifics and BR Standards at Bournemouth Central and Weymouth. This is followed by a trip along the line visiting locations such as Radipole Halt, Upwey Wishing Well Halt, Bincombe Tunnel and Dorchester South. Spot the ex-LMS Black 5 interloper! 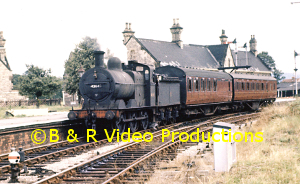 Next, we visit the ex-GWR Bridport branch from Maiden Newton with a number of specials along the branch featuring Ivatt 2-6-2 tanks using both black & white and colour footage. By contrast, there is a DMU trip along the line shortly before it closed in 1975. In earlier times, we visit the Somerset & Dorset line with black & white scenes of Bath Green Park shed including ex-SD&JR 2-8-0 7Fs. Back to colour and footage of Bath Green Park station and views inside its famous train shed. We now travel along the line through Devonshire and Combe Down tunnels, Midford, Wellow and Radstock to see coal trains hauled by 7F 2-8-0s. On past Chilcompton, we climb to Masbury Summit, Shepton Mallet and Evercreech Junction. There are scenes of the line to Glastonbury, at Burnham-on-Sea, and Highbridge and Bridgwater. Travelling south from Evercreech, we pass through Wincanton and arrive at Templecombe for the junction with the ex-SR main line. A busy scene here, with a variety of trains and engines in and around the station, shed and junction. Even 92220 “Evening Star” is on a normal service train! We continue south to Stalbridge, Sturminster, Shillingstone, Blandford Forum and Bailey Gate joining the main line at Broadstone Jct. before continuing to Poole and arriving at Bournemouth West. Finally, there are views of the LCGB S & D farewell special with two unrebuilt Bulleids, some final scenes from the S&DJR line and we close with a classic S&DJR 7F under the train shed at Bath Green Park station. Steam traction featured includes many Standards, Bulleid Pacifics, 4Fs, 7Fs, Black 5s, 9Fs, and Panniers plus Collett 0-6-0s on the Glastonbury line including the now preserved 3205. All the archive film used is mainly in colour but some black & white footage is used. An authentic soundtrack has been added along with an extensively researched commentary. Cover Photo:- Jim Clemens. 80138 at Evercreech Junction, March 1966. Chris Noyle filmed railways in Britain and Europe from 1962 to 1972. This is the third volume from his collection and mostly features the steam scene on the Midland Region in 1967 & 1968. We start at Carlisle with 8Fs on passing trains followed by footage of locos being turned on Kingmoor shed’s turntable featuring Black 5s and 9Fs (even a former Crosti boilered example.) At Upperby Shed there is a line of withdrawn Britannias but inside we see a clean 70013 “Oliver Cromwell”. Back at Citadel station there is a lot of activity with Ivatt 4MT 2-6-0s on freight trains. South to Tebay and scenes of passing goods & parcels trains as well as the Standard 4-6-0s banking engines on duty and positioning ballast trains for local trackwork relaying. Chris visited Stoke-in-Trent during the last days of steam in 1967 and we see many shed scenes featuring 8Fs, Black 5s and Standard 4s including (now preserved) 75029 being serviced. Returning to the North West, Chris visited Patricroft shed for more 8Fs and Black 5s including 45156 “Ayrshire Yeomanry”. There are a variety of 8F workings on Chequerbent incline before a visit to Bolton in 1968. Amongst all the steam workings we see a rare glimpse of a pair of Metro-Vick CoBos passing by, light engine. On the Padiham line, 8Fs are on coal trains before we visit Rose Grove shed, at the end of steam, Todmorden and Copy Pit Incline. At Accrington 70013 passes by and there are some shots of Eccles, Lostock Hall Shed and (now preserved) 45305. At the very end of steam, Chris recorded many specials. The last remaining Britannia, 70013, is seen passing through Bolton on a special and on the line towards Skipton. Then at Kearsley double-headed Black 5s pass by on specials and towards Entwhistle. The very last day of BR steam was 11th.August 1968. Chris was on the Settle & Carlisle line to film the two Black 5s and 70013 pass by both light engine and hauling the famous last steam hauled special. The following weekend, Chris visited Carnforth shed to see the last steam engines there; some would be preserved but most would be scrapped…..
With the end of main line steam, Chris visited industrial sites with ex-BR locos. We see an ex-GWR pannier in the Rhondda Valley and J94 68078 at Widdrington Colliery. He then visited France, to see 141Rs at work in and around Calais & Boulogue, then to Spain, Portugal and Germany. We finish in Austria with snow covered tracks, a steam hauled double headed train leaving in sub zero temperatures, and a steam hauled snow plough clearing the tracks! All the archive film used is virtually all in colour and an extensively researched commentary along with an authentic soundtrack has been added. Cover Photo:- Keith Pirt/Courtesy Booklaw Publications. 8F 48062 and a Standard Class 4 departs Rose Grove, 1968. “Steam Routes” is a series of films featuring steam traction along specific routes rather than areas, mostly using previously unseen 1960s archive film. Here our fourth instalment contains film of the West Coast Main Line from Tebay and Shap Summit to Carlisle, Beattock Summit and onwards via Carstairs to Glasgow. We start at Tebay with views of the banking operations to the summit at Shap plus operations at the quarry exchange siding, before descending to Penrith for scenes at the station and its approaches. The line to Keswick, Bassenthwaite & Arnside is visited with an Ivatt 2-6-0 hauled railtour in 1966. At Carlisle Citadel station, steam is all around and being used on normal service trains as well as railtours. Engines featured include Ivatt 2-6-2Ts, Britannias, Clans, Black 5s, Coronations plus some ex-LNER locomotives from Edinburgh. There is plenty of steam action at Carlisle Kingmoor depot! Northwards, we travel along the ex-NBR Waverley Route to Riddings and visit the Langholm branch with a J39 0-6-0. A4s and A2s are also seen on specials on the Waverley Route. We return back to the WCML at Rockcliff and Gretna for views of passing steam hauled trains. Travelling further northwards, we visit Dumfries, on the ex-GSWR main line, and the former “Port Road” to Stranraer for scenes at Castle Douglas plus token exchanging at Crossmichael with a Crab 2-6-0! More scenes at Dumfries station include 4472 on a special and we return to the WCML at Lockerbie for some depot shunting with a Pickersgill tank! We continue on to Beattock for footage of the station, yard and the banking operations for the climb to the 1015ft summit. There are even views inside Beattock Summit signal box and passing locomotives include Clan Pacifics and A4 “Kingfisher” on a freight! Finally, we descend to Carstairs, Carluke, Motherwell and into the suburbs of Glasgow including Wemyss and Gourock before arriving at Glasgow Central with steam and blue electrics. Cover photo: Keith Pirt/Courtesy Booklaw Publications, Britannia No.70025 “Western Star” on Shap Summit. Our “Steam Still at Work” series of films (formerly called “Return to Steam”) features the steam scene after the end of main line steam on British Railways in 1968. The series continues until the “Return to Steam” tours on BR in October 1971. In this our second part, we cover the period 1968 to 1969 and include some preserved railways that started then. Their early preservation scenes contrast starkly with what we see today! From 1968 to 1971, 4472 “Flying Scotsman” was the only steam loco permitted on the main line and so we feature a number of its tours. We begin, on 11th.August 1968, with that last steam hauled train on BR, the “15 Guinea Special” here double-headed by Black 5s on the Settle & Carlisle, along with some sombre views of the last steam locos at Carnforth. In the Autumn 1968 we visit the Severn Valley and Keighley & Worth Valley railways for early preservation scenes plus 4472 on the ECML. Next, a maritime interlude for rare footage of paddle steamers on the BR owned Humber ferry! Then to the Wallingford & Cholsey line for steam with the GWS‘s 1466 & auto-trailer. A visit to the Longmoor Military Railway for views of blue 0-6-0ST “Errol Lonsdale” and 2-8-0 “Gordon” in use. At Tyseley Open Day we see “Clun Castle” and “Kolhapur” on shuttles with 4472 arriving on the main line. Count the number of steam whistles on display! In France, steam was still in everyday use and we see SNCF 141Rs on rail tours and service trains. Back to the UK for 4472 on the “Yorkshire Harvester” train from Kings Cross to York and a visit to the old York Museum. At Bath Road Depot Open Day, we see steam visitors & electric loco AL4 E3044! We visit Bulmer’s at Hereford to see newly restored No.6000 “King George V” pulling their Pullman train. Then to Bury depot for 5596 “Bahamas” and, despite the ban, its transfer trip (in steam) along BR lines to a new home at Dinting! We visit Northamptonshire for the industrial workings in the quarries and steelworks and special trains. Then more early views in 1968 of the KWVR and the Bluebell Railway. Compare these scenes to those of today. What a contrast! At Bressingham Gardens, a “caged” 70013 “Oliver Cromwell” is seen giving cab rides plus scenes of the narrow gauge lines there. More 4472 tours include the Midland, ECML, Ely & March. At Finsbury Park Shed, the narrator is seen cleaning 4472’s nameplate! Finally a few visits in 1969 to Dinting, the KWVR (for a glimpse of unrestored 46115 “Scots Guardsman”), the Bluebell Railway and lastly to the newly reopened Dart Valley Railway for auto-trains with “engines in the middle”. All the archive film used is in colour and an extensively researched commentary and authentic soundtrack has been added. Cover Photo:- Colin White, Fairburn 2-6-4T No.2085 at Haverthwaite, L&HR. The Chris Noyle Collection No.1. Chris Noyle filmed railways in Britain and Europe from 1962 to 1972. This is the first part from his collection and features rail tours in England during the period 1964 to 1967. The area covered was from south to north including some long closed lines and using locomotives often to be withdrawn as the last in their class. And often a single tour would involve many changes of motive power. With footage from a variety of rail tours, and many steam hauled normal service trains in the background, we visit the Weymouth Quay Tramway for 13xx panniers, the Bluebell line in the early preservation years, Kings Cross and the ECML with a double-tendered 4472 “Flying Scotsman”, Westbury, Nottingham Victoria, the Settle & Carlisle, Waterloo and Sussex. More scenes and Wellingborough, Higham Ferrers, Northampton Bridge Street, Kettering, Spondon, Derby and a 4F on the Wirksworth branch. Also featured are tours in the Thames valley including Witney and to the north, Haydon Bridge with ex-LNER 62007, Newcastle with a V2 and passing green NE electrics. Among other locations and lines visited are Weymouth with A4s, Yeovil Junction, Eastleigh, Swanage, Bridport, Ilfracombe, Highbridge with two Ivatt 2-6-2Ts, Bath Green Park with two unrebuilt WC pacifics and the Isle-of-Wight. Are some of the Ventnor scenes a model? No, they are very real! Locomotives used include ex-GWR Panniers, Prairies, Halls & freight 2-8-0s, ex-Southern S15s, U Class 2-6-0s, Q1 and Bulleid pacifics, ex-LMS 3Fs, 4Fs, Patriots, Jubilees and Black 5s, ex-LNER J11, V2, A3 & A4 pacifics and even a B16. Also many BR Standard types including Britannias, 9Fs and the last one of all, 92220 “Evening Star”. A veritable variety! We conclude with rail tours in and around Manchester, Carnforth and the North West during the dying days of steam between 1967 and 1968. A mixture of 8Fs, 9Fs, Standard and Black 5s, Britannias and Standard 4 2-6-0s are seen in normal daily service as the rail tours pass by. Chris always used Kodak colour film. This has served the test of time and all of the footage is in wonderful colour. An authentic sound track has been added along with an extensively researched commentary. Our series of films along the West Coast Main Line has nearly come to an end, reaching Glasgow Central this time. However, we start at Stockport with 70013 “Oliver Cromwell” in April 1968 before moving on to Preston in 1965, the stepping point for a visit to Blackpool Central just before it closed in 1964, with views of the shed there. We return to Preston to travel north again over Shap to Carlisle. Another way to Carlisle is via the Settle and Carlisle route and we show scenes from this line using previously unused new footage. At Carlisle, there is extensive coverage of lines and locomotives including a visit to Kingmoor shed. Many engine classes are seen including Princess Coronation Pacifics, Royal Scots, Jubilees, Black 5s and BR standard types such as Class 5s, 9Fs, Britannia and Clan Pacifics. Onwards and we visit Dumfries on the old G&SWR route before returning to the West Coast line over Beattock including scenes from the footplate as we reach the summit. Preserved Highland Goods 4-6-0 No.103 is seen on the Inches branch before we finally reach Glasgow Central. An all colour film with excellent detail and locations, mastered with an authentic sound track and an extensively researched, detailed and informative commentary. Details of our extensive collection of archive films of the steam scene all over Britain filmed from the 1950s to 1960s are available from the address below. Cover photo:- Keith Pirt/Courtesy Booklaw Publications, Class 4 2-6-4 tanks at Glasgow Central, July 1959. The second of our archive films covering the Settle & Carlisle route over the Pennines. We start with an introduction to the route, including a 1964 rail tour from London St.Pancras to Carlisle using a Jubilee locomotive and ex-LNER V2 and A3 classes. There are scenes of Leeds to Settle Junction and views at Skipton. Coverage of the “Little North Western” line to WENNINGTON and the Midland Railway’s first attempt to reach Carlisle in the 19th. Century. We then return to Settle Junction for a detailed look at the Settle & Carlisle line north with the ascent to SETTLE, HORTON, RIBBLEHEAD, DENT, GARSDALE and AIS GILL followed by the decent to APPLEBY, CULGAITH, ARMATHWAITE, CUMWHINTON and CARLISLE. The archive film features many ex-LMS engines such as Jubilees, Black 5s, Stanier 8Fs, Midland 0-6-0s, BR Standards, Princess Coronation pacifics and some ex-LNER A1 and A4s. The film includes brief sequences of the “Return to Steam” workings for continuity, and finishes with scenes of steam workings at Carlisle. With 85 minutes of coverage, the best of the original film has been taken and restored to the highest standards. An authentic soundtrack has been added along with an extensively researched and informative commentary. All the film material is in colour. Cover photo:- Keith Pirt/Courtesy Booklaw Publications, 9F 92015 passes Dent, March 1967. In this next part of our detailed journey of the West Coast Main Line from London Euston northwards to Carlisle and Glasgow, we cover the 30 mile descent from SHAP back to sea level at CARLISLE, with many views of steam hauled trains featuring BR Standards, Princess Coronations, Royal Scots, Patriots, Jubilees and freight trains worked by Stanier Black 5s, Stanier 8Fs and BR Standard 9Fs. Shap Quarry is served by Harrisons Sidings and there is a detailed look at traffic passing and visiting the quarry with 9F and Britannia haulage.On to PENRITH, where more steam power is seen through the station, followed by a DMU trip along the line to KESWICK just before it closed. We reach CARLISLE, where we see plenty of steam action on service trains to this border city as well as rail tours featuring engines such as A4s off the Waveley Route, preserved Scottish engines and even an ex-GWR Castle! KINGMOOR depot is visited at length both before and after the building of the goods yard. Full of steam in the 1960s, there is much variety here including visiting engines off the Settle & Carlisle route. Cover Photo:- Keith Pirt/Courtesy Booklaw Publications. 9F 92054 at Hackthorpe, July 1967.